Review: The Smoke by Simon Ings – AiPT! Love, loss and loneliness in an incomprehensible world. 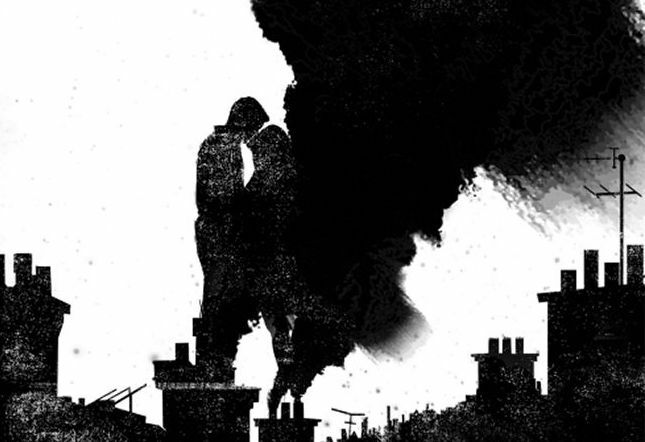 “Simon Ings’ THE SMOKE is about love, loss and loneliness in an incomprehensible world. For you, that means returning to Yorkshire and the town of your birth, where factories churn out the parts for gigantic spaceships. You’re done with the pretentions of the capital and its unfathomable architecture. You’re done with the people of the Bund, their easy superiority and unstoppable spread throughout the city of London and beyond. You’re done with Georgy Chernoy and his questionable defeat of death. You’re done with his daughter, Fel, and losing all the time. You’re done with love. It’s hard to say precisely who the main protagonist is in The Smoke. Aspiring architect Stuart Lanyon is the closest to fit the bill and seems to be the hub to which all the other characters are connected. There’s his brother Jim, who is preparing to become an astronaut, and Bob, his working class father. Fel, Stuart’s genius girlfriend, is the daughter of Georgy, a rich and influential physician, whose breakthroughs with extending a person’s lifespan makes up a significant subplot. Oddly, Georgy’s girlfriend Stella, who is developing a low class TV show that also becomes a subplot, is Stuart’s aunt, sister to Stuart’s mother Betty. Betty happens to be dying of cancer. The smaller cast of characters and their interconnectivity helps somewhat, as the way the plot is presented can make the story confusing at times. The world in which Stuart lives, an alternate 1950s England as far as I can tell, has an array of technological differences and advances not present in ours, the most plot-centric being a biophotonic ray that leads to the development of a technology that effectively splits the human race into three separate species. Oddly, class has more to do with what species results than any other factors. The Bund are the highest class and most technologically advanced of the three. Next are the regular humans, like you and I, which make up the middle class. The lowest are the “sub-human” Chickies. They have an odd ability to biologically stimulate humans sexually, into an almost trance. The story obviously has themes of class warfare, with the lines definitively drawn. It isn’t so much alluded to as it’s broadcast so the reader can clearly see it as a factor that weighs heavily through every decision a character makes or plot point that develops throughout the narrative. The thread the book follows, of a relationship between Stuart and Fel, is affected and colored by it. So too, the conflicts that arise when Betty is given a chance to live past her terminal diagnosis through a very strange procedure. It sees her being reborn into a fast growing infant body, which retains her memories but has to learn language and motor-skills again, like a regular baby. The author’s imagination can’t be questioned, nor the way he uses it to highlight real world issues. The problem arises from whether or not the reader will be able to piece together the narrative or the ideas he is trying to express because of the way the story is told. First person narrative isn’t used in novels nearly as much as third, unless a writer has a very specific reason to do so, as it confines all the thoughts and opinions to the inner monologue of one character. Here, not only does the book contain first person, it also jumps back and forth to the rarely used second person, with the narrative putting “you” in the role of the main character. Along with large amount of flashbacks used throughout, the switching narrations will definitely not make piecing the larger puzzle of the story together easy for most readers. In The Smoke, Ings took a brave approach with the way he presented the story. His imagination certainly can’t be called into question and his prose is very eloquent. He has the knack of turning a phrase to make it memorable. Whether or not his use of the second person narrative succeeds will differentiate between readers, but at times I found it jarring and took me out of the story. Still, I would rather read a book that felt inventive and refreshing. I found the overall experience of The Smoke enjoyable.